Only The Netherlands who finished first in the Girls series made a difference at the list of the gold medals awarded at the 2005 European Youth Team Championships: the other two titles – in the Juniors and Schools – remained in the hands of Poland. Indeed, Poland managed to score a very rare record by catching a double victory for the second event in a row! The 2005 European Youth Team Championships took place in Riccione, Italy, July 13-23. As the result of the change of cycle, this event was the first to be held in a odd-numbered year, just months after the previous such event held in Prague, Czech Republic, last August. 46 national teams from 25 countries competed in the Championships’ three series for Juniors (up to 25), Schools (up to 20) and Girls (female Juniors). The new European Junior Champions are Konrad Araskiewicz, Krzysztof Buras, Jacek Kalita, Krzysztof Kotorowicz, Piotr Madry, Lukasz Brede and npc Marek Markowski. In the Juniors, the battle was fierce but Poland had no difficulty to climb to the top of the table a few round before the end and stay there. Behind them, the fight for the other medals and also the qualification for Europe’s representation in the 2006 World Youth Team, saw Italy landing comfortably in second place. France went up three places in the very last round to finish third, leaving Norway fourth. Finally, Hungary, repeated last year’s triumph by qualifying again for the World Championship from fifth place. In the Schools, not only Poland went up to the podium to receive the gold medal for the second consecutive year, but also Israel followed their similar success in Prague with the silver medal. Norway reminded everybody of their dominant position in the world of youth bridge by taking the bronze, while Latvia and Sweden finished immediately behind. Finally, in the Girls, Sweden retained the second place they had taken last year, but defending champions Austria dropped third, as this year the title went to The Netherlands. The 20th European Youth Team Championships was held in Riccione, Italy, from 13 to 23 July 2005. The event comprised a Junior series (for players born in 1980 or later), a Schools series (for players born in 1985 or later) and a Girls series (for players born in 1980 or later). It was open to national teams of the EBL member countries and was organized by the European Bridge League in cooperation with the Italian Bridge Federation. The Championship is the flagship of the EBL youth programme. It was inaugurated in 1968 in Prague (Juniors only), and since then has been held regularly every two years. The Schools series was added in 1994 to accommodate younger players coming out of national bridge programmes for school children, while the Girls series (for female Juniors) was inaugurated last year. 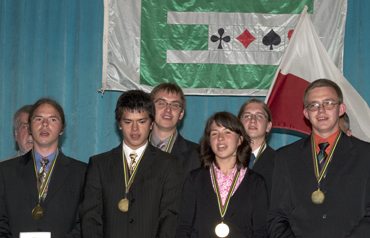 The 19th event of the series was organized in August 2004 in Prague, Czech Republic. The reigning champions are Poland in both Junior and Schools series and Austria in the Girls Series .